This is a CT scan of temporal bone. Soft tissue shadow seen occupying the middle ear cavity, it even extends to involve mastoid air cell system. 1. What view is this CT scan ? 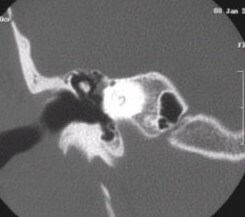 This is a plain CT axial view of temporal bone. 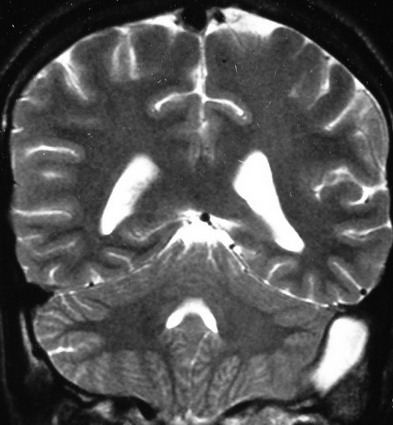 What could be the clinical manifestation seen in this patient ? These patients commonly manifest with conductive deafness due to the presence of hematoma in the middle ear, or disruption of ossicular continuity. 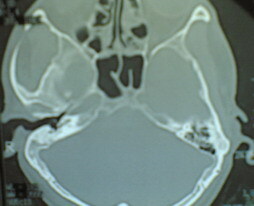 This is a HRCT of temporal bone, axial view. 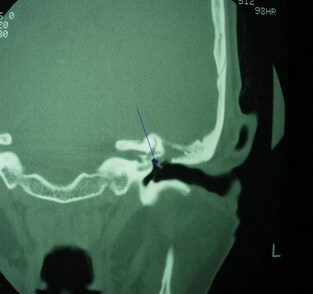 Shown below is the CT scan of a patient before cochlear implant procedure. 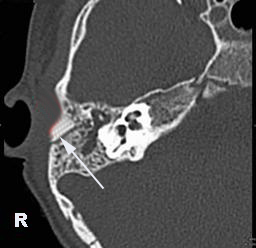 This is a HRCT of temporal bone showing ossified labyrinth. (Labyrinthitis ossificans). In these patients since the round window is totally obliterated due to ossification it will be difficult to place the cochlear implant electrode. A third window will have to be drilled for placement of cochlear implant electrodes. Name the pathology seen in this CT scan. What type of hearing loss this patient will have ? 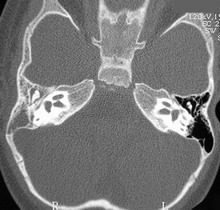 This is a axial CT of temporal bone. 2. Why is the discharge foul smelling ? 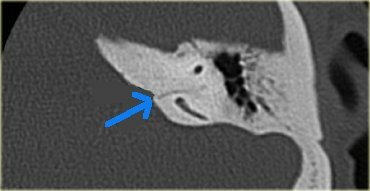 This CT shows erosion of the outer attic wall on the left side. 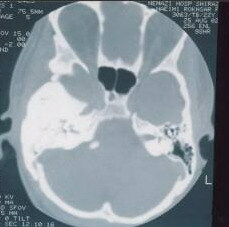 This could most probably be due to cholesteatoma. 10 year old boy with h/o grommet insertion left ear one month back. Ear drum can be clearly seen. 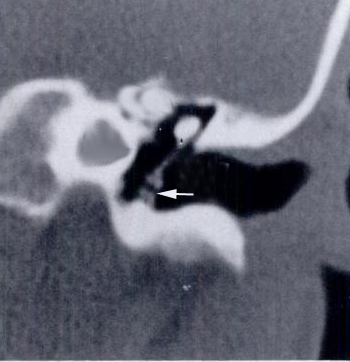 There is a communication between the external canal and middle ear cavity as pointed by the white arrow. Temperature chart shows classic picket fence appearance. 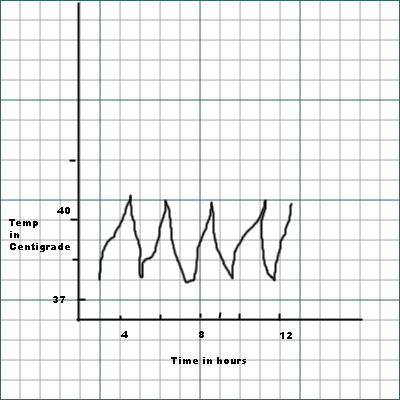 The temperature does not touch normal at any given point of time. 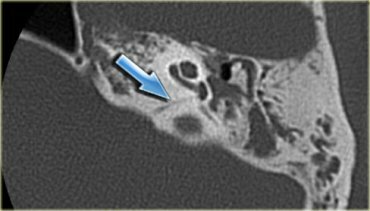 MRI shows clot in the left lateral sinus. O/E: Ear drum was found intact in the right ear. 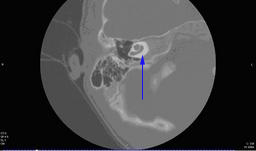 Soft tissue shadow is seen occupying the middle ear cavity close to the long process of incus. Possible diagnosis is cholesteatoma ?? congenital. Comment on the CT brain displayed. Which condition commonly cause this problem? 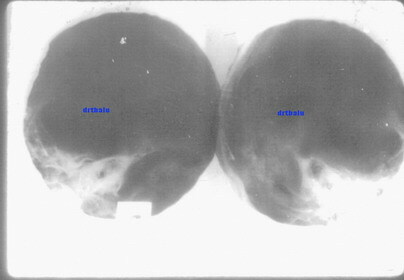 Shown here is the CT scan (axial cut) of petrous bone area showing glomus jugulare as marked there. How do you differentiate it from high jugular bulb and aberrant internal carotid artery? 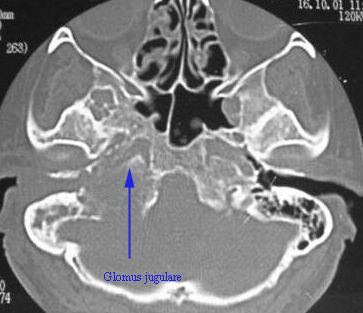 In patients with glomus jugulare and high jugular bulb the jugular fossa is enlarged. But in glomus jugulare the cortex of the jugular fossa appears eroded while in patients with high jugular bulb this erosion is not seen. 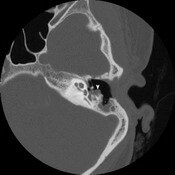 To rule out aberrant carotid artery a coronal CT of temporal bone is a must. If the carotid canal is normally placed then glomus tympanicum should be considered, whereas if the same is placed laterally then aberrant internal carotid artery is a good diagnostic possibility. Name the structure pointed out by the arrow. This is petromastoid canal also known as subarcuate canal. confused with that of fracture line. It is a cochlear aqueduct. It connects perilymph with the subarachnoid space. labyrinthitis ossificans is caused in a patient with meningitis.